I made this white wine sangria for our Fourth of July bar-b-que. Big batch drinks are always easier to serve a crowd, and this one was mellow enough that people could enjoy multiple throughout the afternoon... and still enjoy the fireworks show later. 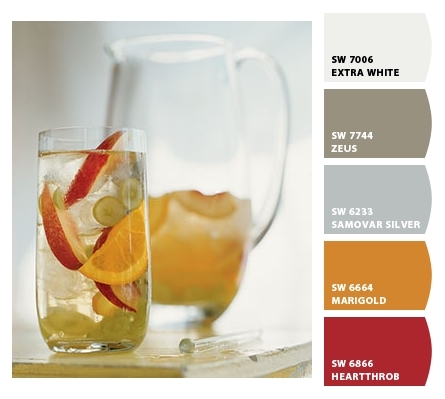 The white wine sangria's crisp colors are the perfect palette to transition to fall. 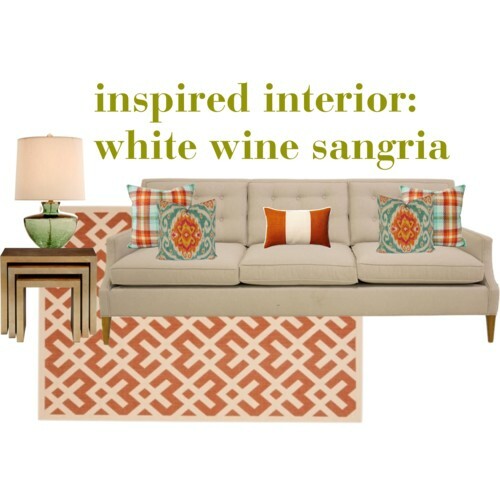 With orange as a new neutral, these colors work so well in the late summer or early fall. In a large pitcher or other container, combine the wine and sugar. Stir until the sugar dissolves. Add the remaining ingredients, excluding the club soda, and mix well. Place the pitcher in the refrigerator and let the sangria sit for at least 1 hour (and up to 4 hours). The sangria will sweeten with time, so the longer it sits, the better. Just before serving, stir in the club soda and ice cubes.